Faber-Castell, known for wonderful high quality artist mediums launch a new product line earlier this year at CHA. Geared for mixed media with an emphasis on stamping these new Design Memory Craft products can bring a great new dimension to all your paper crafts! I recently got to try out some of the new Mixed Media and Gelato sets. The sets are separated by color families (red, yellow, blue and green) which makes for fun and easy color mixing and matching. They are also odorless and acid free, both big pluses! I tried the red Mixed Media set which included a stampers big brush pen, metallic artist pen, Aquarelle watercolor pencil, pastel pencil and a metallic gelato. This set is a great way to try different mediums and to be able to achieve different textures and techniques, all in the same color family. 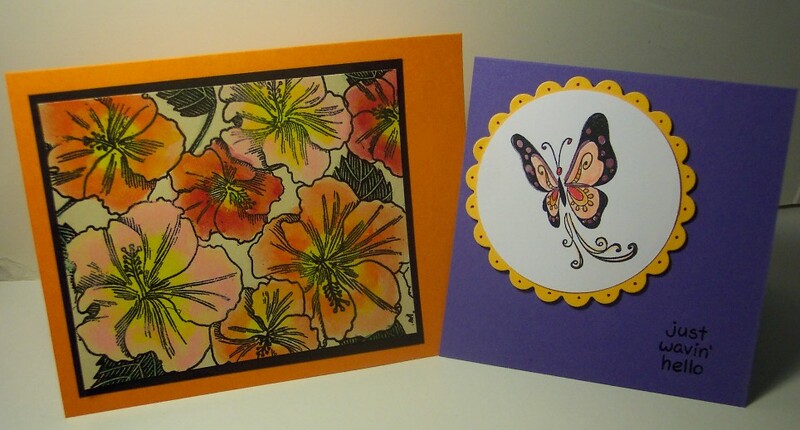 In my butterfly card sample I used everything that came in my red Mixed Media kit. The pastel pencil works great for a softer chalky look, the watercolor pencil bended nicely with little water needed to move the color around. The metal pen is nice and shiny as is the metallic gelato. The big brush marker works really well to color directly onto stamps, giving you the option of easily adding multiple colors to a single stamped image. This white tag shows you what each medium looks like alone. From left to right it’s: gelato (w/ water), gelato (no water), brush pen, artist pen, watercolor pencil (w/water) and pastel pencil. 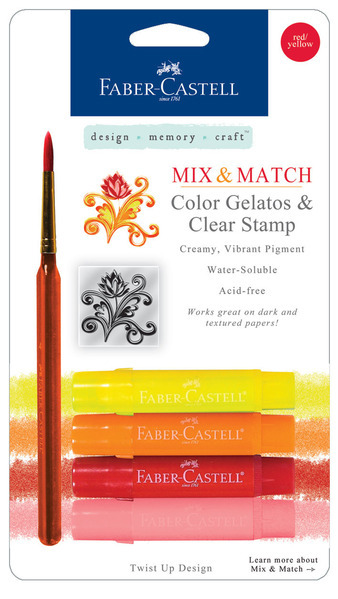 The second card is made with the red/yellow Gelto kit, which comes with four gelatos, a brush and a clear stamp. I embossed a large flower background stamp with black embossing powder and colored the flowers with the gelatos and water. 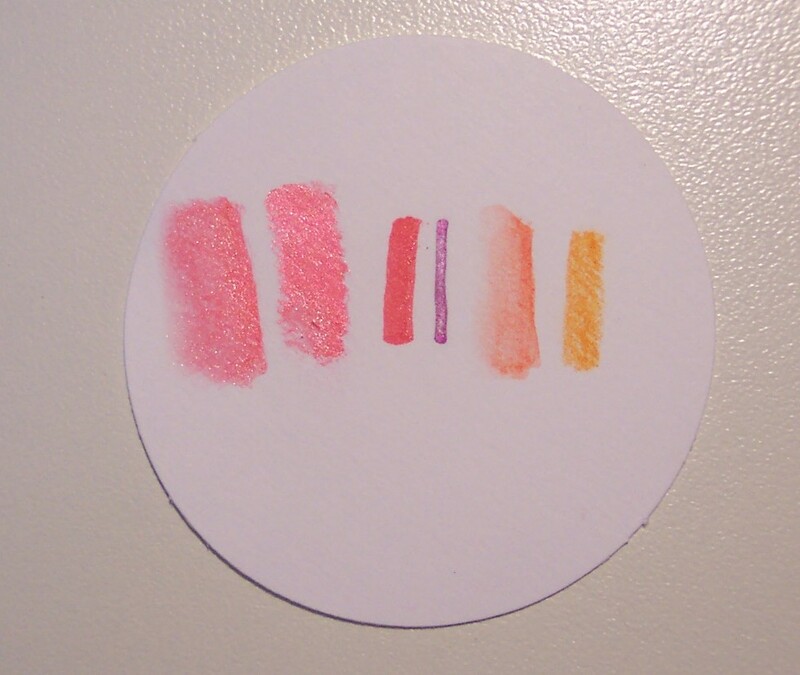 The gelatos are like creamy crayons with a nice bright pigment and they can be used with or without water. You can use the enclosed brush or I used a watercolor brush with a water reservoir, it just makes things go a little faster. I applied the gelatos directly onto the stamped image and used the brush to pull and blend the colors. You can layer different colors and also get different intensities of the same color depending on how much water you use. I love using different mediums in my stamping, it gives such a variety and if your looking to try something new and different I highly recommend these fun new kits from Faber-Castell! For more info please check out their website here: Faber-Castell, or follow them on Twitter @DesignMemCraft or Facebook. And check back here on the blog on Thursday for a wonderful giveaway from Faber-Castell!